Climate change represents one of the greatest threats to humanity in the 21st century, threatening the lives and livelihoods of hundreds of millions across the world. The Coal-free Finland campaign is aiming to end Finland’s reliance on fossil fuels endangering a livable climate – one power plant at a time. The campaign aims to hasten the direly-needed transition towards a Finnish fossil free economy powered by renewables instead of the dirty energy sources of the last century. A historic energy transition is already occurring globally, with old fossil fuel generation being replaced by renewables at an accelerating rate. A race is on to power the world with clean energy before catastrophic climate change becomes inevitable. 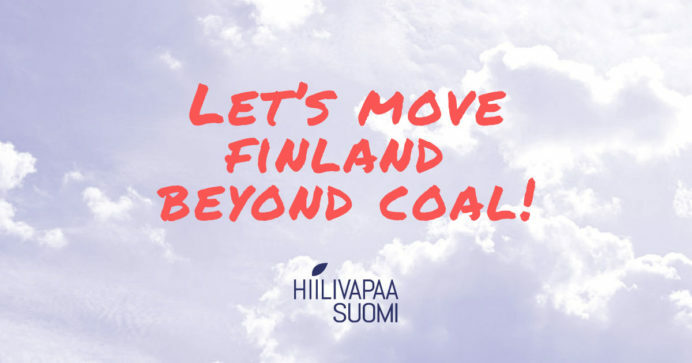 The Coal-free Finland campaign is taking action to ensure that Finland does its share and meets its commitments made in the internationally-binding climate treaty signed in Paris. To meet these targets, Finland must stop burning coal and peat – the dirtiest of fossil fuels – at the soonest possible date. Coal-free Finland is campaigning to replace coal plants at a municipality and city level, with groups working in municipalities across Finland where citizens have decided to take action. The campaign is working in collaboration with the Finnish Friends of the Earth and the The Finnish Nature League and is run by volunteers from a variety of backgrounds. The campaign’s methods include lobbying and advocacy, participating in public debate, awareness-raising among citizens and stakeholders. New volunteers – including English speakers – are always warmly welcome. Get in touch and let’s discuss how you can be involved in ridding Finland of coal! Want to support our campaign financially? Donations to the campaign can be given through Friends of the Earth Finland’s donation service (site in Finnish). According the the energy industry, 24% of the district heating in Finland is still produced by coal. Other prominent sources of heating are wood, gas and peat. Due to the high emissions of peat, Coal-free Finland campaign advocates both for coal and peat to be phased out from the Finnish energy system. Currently, there are a total of 12 plants that use coal as their main fuel in Finland (Finnish Energy Authority). Some of the biggest coal power plants in Finland are located in Helsinki, Espoo, Vantaa and Naantali. In 2014, 75% of Finnish climate emissions came from energy production and consumption. Phasing out coal and peat would put Finland a long way in carrying its climate responsibilities.